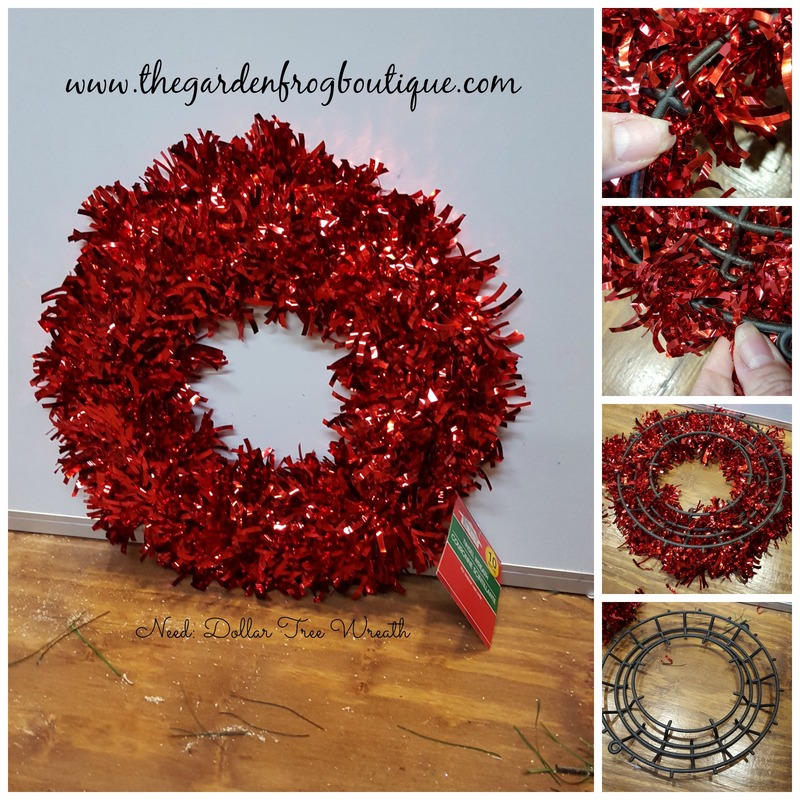 I removed the red garland from the plastic wreath frame and if you check out the pictures you can see that notches where the garland is looped around. I started by pulling the garland over each of those notches and it came off easily. Since I already had an abundance of Oak Leaves and sticks in my yard and Rustoleum Metallic gold spray paint, the project cost less than $6. If you had to buy the metallic spray paint, this project could still be done for around $10. Are you interested? The gold leaves were done a couple months ago to make sure it would work. I am going to gather more gold leaves to make a garland and who knows what. I confess: I am addicted to spray painting. You could easily use silk flowers of your choice and ornaments that you may already have. 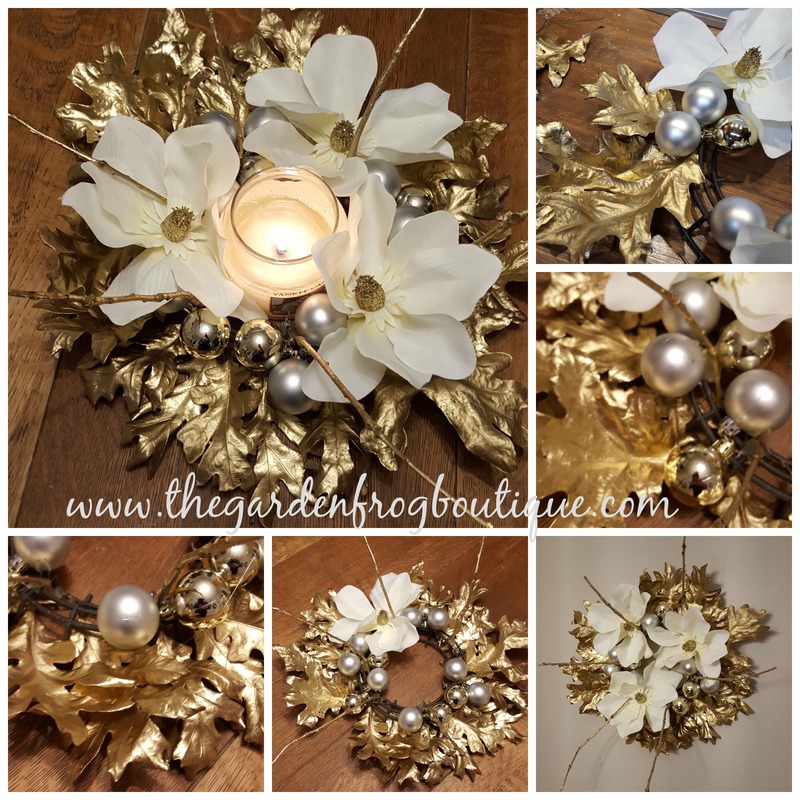 This wreath is only 10″ so I felt the smaller dollar store ornaments in the tube would work. I love the clip on Magnolias too and wish I would have gotten more! 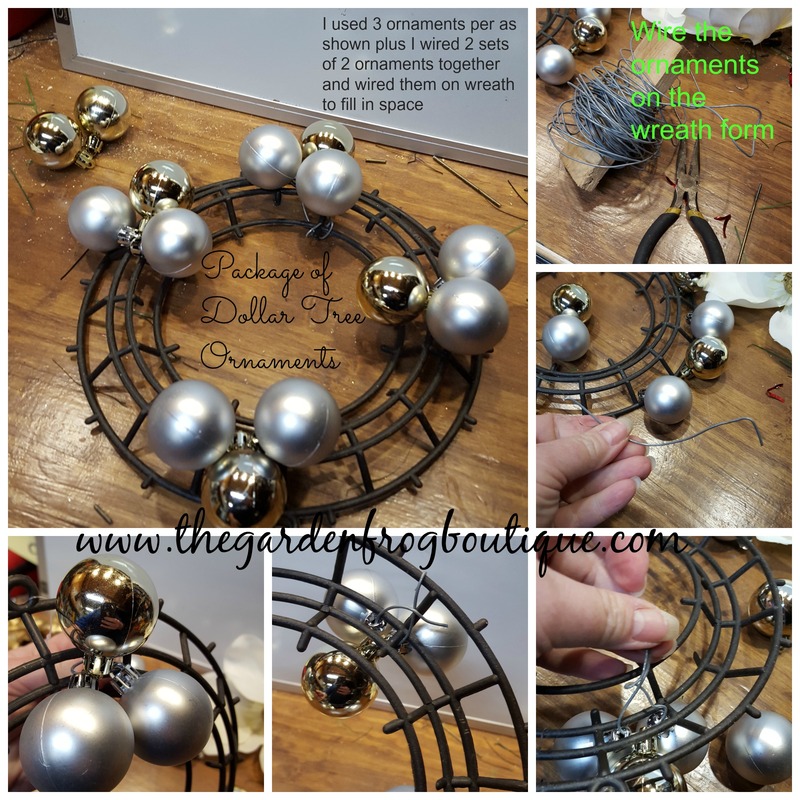 I used wire I had in the garage for the ornaments and you could use the hot glue gun too but I felt the wire added a bit more support to the plastic wreath frame. Before I hot glued the leaves and sticks on I wired on the ornaments in groups of 3 and then since I only had 3 magnolias I had to center the to be symmetrical with the ornaments. There were actually 4 ornaments left so I wired them in 2 groups of 2 and put the on each side of one of the clip on Magnolias to fill in. I then took off 2 of the magnolias (I needed a visual when gluing) and glued on 6 gold painted sticks to stand upright. This was the hardest part of the whole projects. You need to glue the stick carefully in places to secure the stick so it takes a bit of trial and error. I then took the gold leaves and started gluing them on the bottom outside ‘rim’ of the wreath. From the picture you will see notches sticking out and I used those as a guide. I glued the largest leaves every other notch and then went back in and added the smaller leaves in between. There is no science and you could add berries or other adornments to this centerpiece. 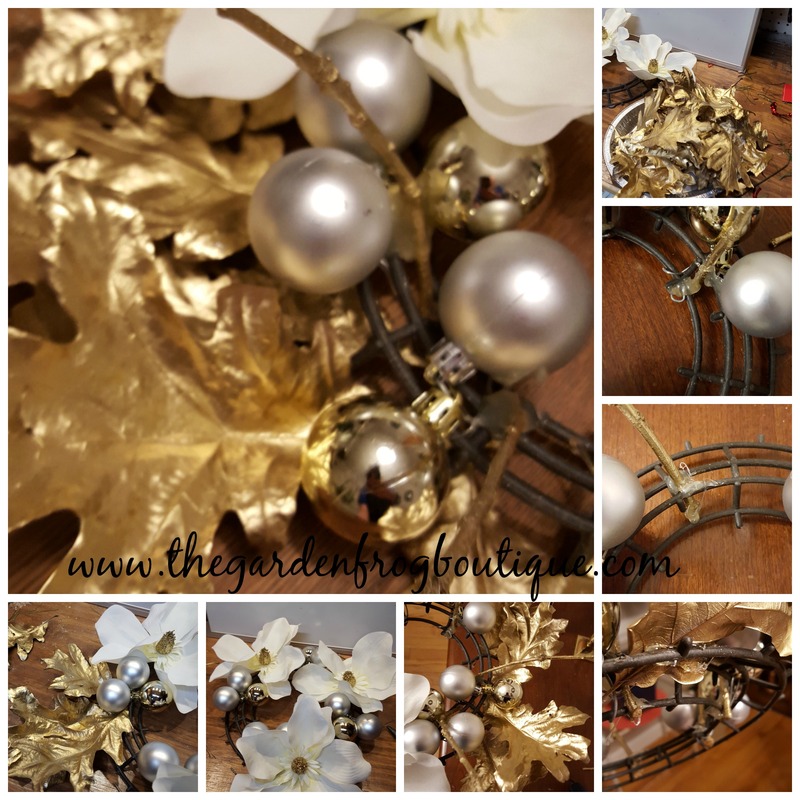 This centerpiece which also could be a wreath took me a couple hours to assemble. I had a candle for the centerpiece that I rarely burn (personal choice to be afraid of burning candles) which fits perfectly in the center. 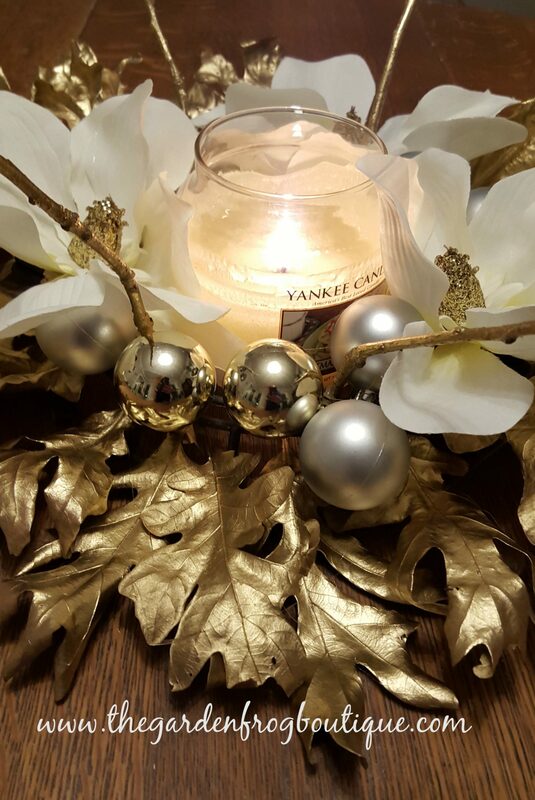 I would very vigilant about burning a candle with the magnolia leaves touching the hot glass! So maybe a battery operated candle or vase would be best. Thank you for stopping by and be sure to check out more on my blog! Beautiful centerpiece! You did a wonder job on it. Love the gold leaves and the bulbs with the Magnolias. These are beautiful! I am so not the creative type and tend to go buy what I need. One year, I will actually take the time to create one of these myself. thank you! they are super easy to create. I love your creation, Renee! So amazing what you can come up with and it doesn’t have to be expensive at all. thank you. I love thinking outside the box and creating. Simply lovely! I need to remember to paint some leaves and put them to use. You have inspired me! Thank you! I love my new gold leaves! Love your creativity and ability to produce an amazing result. I make jewelry and have no craft skills. Thank you. I have seen your beautiful pieces and you do have some skills! I love the gold leaves. I don’t have an oak tree, but I know where there are a few of them. What a fantastic look! I have plenty of Oaks! Thank you for stoppy by! This is beautiful, Renee! And so creative. I love it! 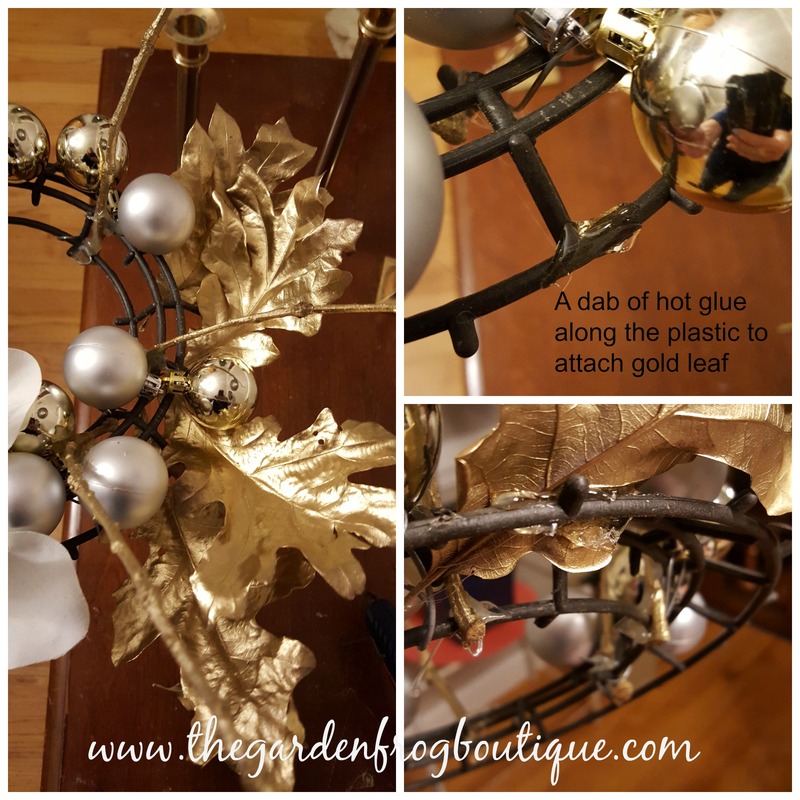 I love the gold leaves – such a wonderful idea that I am going to try soon. It’s a beautiful centrepiece. Thank you for the great ideas. Thank you! I am spraying more leaves today for another project. Love how you take something so simple and create such wonderful and fun pieces. And it looks like you are having a fabulous time doing it too. It is amazing what our resourcefulness and creativity can come up with. 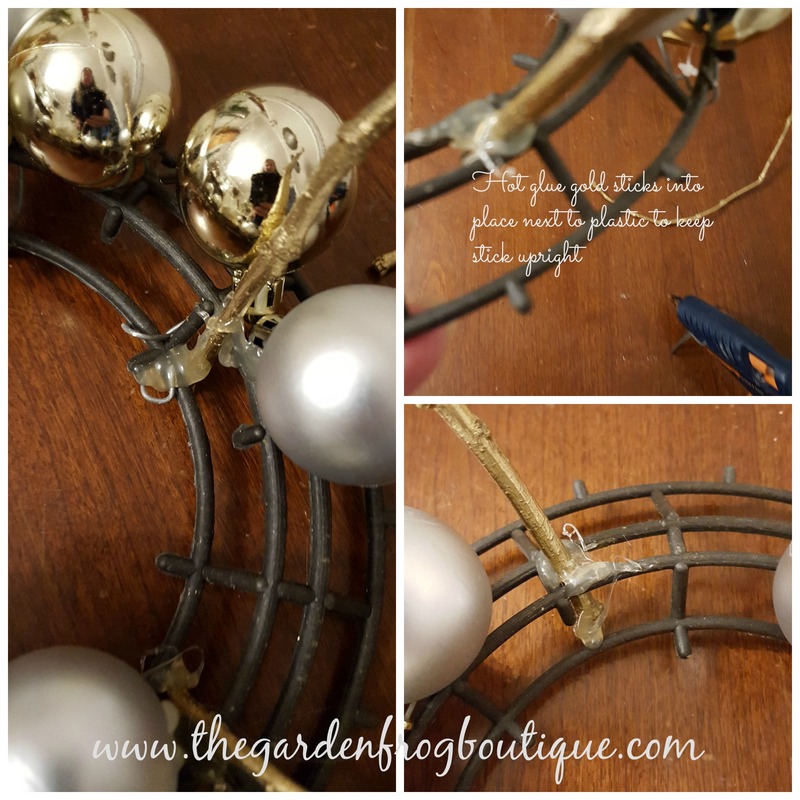 I am sure the people who love to hand make holiday pieces will really enjoy your step-by-step instructions. Thank you! I love creating.